Electric heaters operate only when the pump is running, so that the heated water can be taken away from the elements, and this is where the danger lies with using too powerful a heater. Less water flow and more power to the heater can damage the heater elements and they can be very costly to replace. We will provide more powerful heaters, up to 6.0kW, if required but will also recommend a change to the pump for this reason. The electric heater is built into the controller and the temperature is set via an easy to use touch pad. The temperature range available is from 10°C up to 40°C which is set by safety regulations and the recommended setting is 37°C though this is a matter of personal taste. The sanitization cycle is also operated automatically by the controller. All electric heaters must be hard wired into the switchboard on a separate circuit by a licensed electrician and this is a cost which must be taken into consideration when purchasing a hot tub. 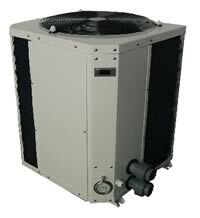 Heat pumps are an extremely efficient use of electricity. They operate in much the same manner as an air conditioner, taking heat from the surrounding air and using this to heat the water. Space is an important consideration with the units needing 500mm all around and 1500mm above so they are not suitable for all locations. 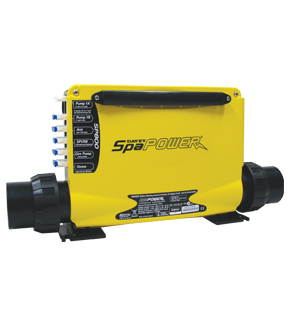 A 3hp/2.1kW unit is sufficient to heat any hot tub and it can be plugged into a standard 10amp power point. While the power input is only 2.1kW the heating output ranges from 10.0kW to 14.0kW. Water flow is not a problem with these units as they require only 150 litres per hour to operate. Gas is a more abundant and renewable fuel and is seen by many as being a way of reducing our dependence on coal and oil and also of course as a way of saving money on operating costs. There are obviously many gas heaters available on the market but we recommend only one which is the Raypak131 Spartan heater manufactured by Rheem Australia Pty Ltd. This heater is available in either Natural Gas or LPG and comes with a built in thermostat and ignition. The heat up time with gas is approximately a quarter of that with the electric heater and less time is needed to maintain the temperature. As with the electric heater the gas heater only operates when the pump is running. Operating costs of course vary depending on several factors but you can expect to see a return on your investment within 2-3 years using Natural Gas. The cost of LPG varies greatly depending on your location and method of delivery so it may cost more or less to run but this may be a viable option where it is expensive to access the amount of power needed for an electric system or sufficient power is just not available. There are a couple of changes that have to be made to system to accommodate the gas. Firstly the traditional controller and touch pad is eliminated so the temperature is set on the heater and the jets are controlled by an air button. 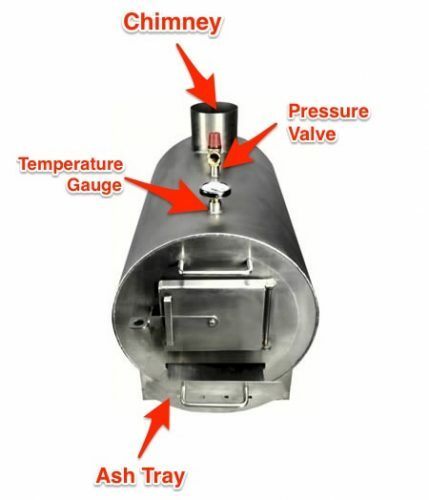 Secondly the heaters are sensitive to changes in pressure so the standard two-speed pump is replaced with a single speed pump which operates the sanitization cycle at full speed rather than half speed, and the timing is set on a pin style timer. We recommend one hour every morning and one hour every evening. This is still a set and forget system. The thermostat range is the same as on the electric heaters being from 10°C up to 40°C. Wood is a renewable fuel and our wood-fired heaters do run on any timber you wish though they are at their most efficient when using soft woods rather than hard woods. Old pallets often end up as ground fill and are ideal as fuel or you can use ground litter if you are in a rural setting. The Chofu wood-fired heater is a stainless steel heater with a double skin to protect the outside from the high temperatures within the firebox and the water is heated via a heat exchanger wrapped around the inner skin. The water is circulation using a process called “thermsiphon”. The heat can be regulated by opening or closing the draft vent but there is no thermostat so it is recommended that you do monitor the water temperature to ensure it does not rise above 40°C. 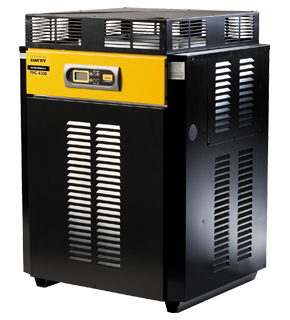 The heater operates independently of any other equipment and can be used in conjunction with other styles of heating to help reduce the heat up time and to lower operating costs. It is ideal in a setting where no alternative power is available to provide warm water bathing.